Winter time can get a little tricky for keeping toddlers busy, especially when it gets too cold outside to play. I’ve compiled a list of 10 activities you can do with your toddler this winter. You can still do a lot of outdoor activities during the day in the early winter, but when it starts getting too cold, just move the activities inside where they can stay nice and warm. I’ve included a mix of indoor and outdoor activities here to help you get a head start! 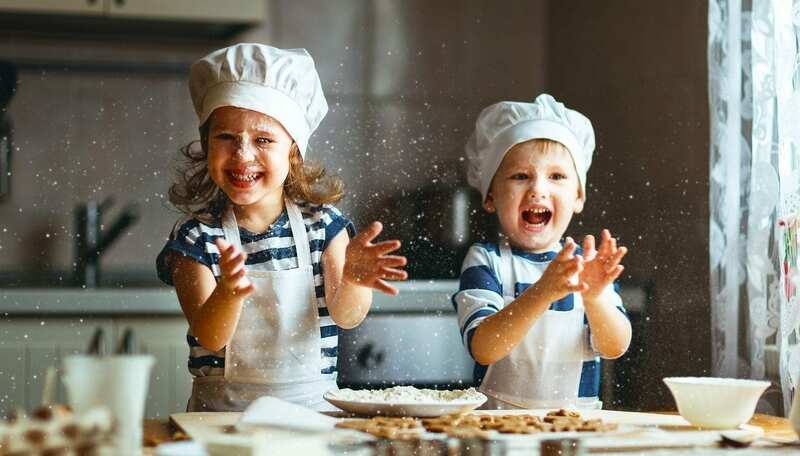 What is more fun for a kid than building with delicious food? Your toddler will think you’re the best mom EVER if you help him build a small house made of graham crackers, icing, and candy. It also a great activity for motor skills, dexterity and creativity! Here’s a great tutorial for building a “gingerbread house” out of graham crackers. 2. Camp in the backyard. Toward the end of fall and into the beginning of winter is the best time to go on a “camping trip” with your toddler. You can purchase a cheap tent and put it up in the backyard that afternoon, then when evening rolls around you could have a camp fire with a fire pit or drink some hot cocoa while snuggling in blankets looking at the stars. When it’s time for bed, everyone can snuggle up in the tent with a bunch of blankets and pillows, tell stories, and make shadow puppets with flashlights! Speaking of camping, one of the most fun activities you can do while sleeping out under the stars in making s’mores! But you don’t have to go camping to do this activity with your toddler. This could be a fun after dinner treat if you have a fire pit. The kids will love making their own gooey dessert! When my kids are outside they love collecting every pretty leaf or prickly pinecone they can find. Sometimes I will have them pretend they’re on a treasure hunt and see who can find the most acorns or pinecones. One thing my kids love to do is collect different shapes and colors of leaves. We will then bring home our best specimens and make fall art collages by glueing the leaves to construction paper. It’s an easy and fun activity and they love it! In the winter months, birds rely more heavily on birdfeeders as food is becoming scarce. A great way to encourage the birds to keep coming to your yard is to make birdfeeders and hang them outside. The kids love getting their hands messy doing this and they especially love when they see birds eating from their very own handmade feeders! Here is a great tutorial for making kid (and bird) friendly bird feeders. One of America’s favorite pastimes in the winter is iceskating. Even if you live in the warmer part of the states, you can find a mall or galleria with a good sized skating rink. Round up your kids for an afternoon on the ice where they’ll get some energy out and perhaps learn a new skill! 7. Bake and decorate cookies. Kids love to help bake cookies! Bust out grandma’s old sugar cookie recipe and put those kids to work in the kitchen. When the cookies are done baking and cooling, having the kids frost them with colorful icing and sprinkles galore. Save the treats for after dinner or pack some in a tin and gift them to neighbors. The kids will be so proud to share their creations with friends! Here is a great recipe for basic, but delicious, sugar cookies. 8. Take photos at the tree farm. You don’t have to be a professional photographer to take some cute photos of your kids in the local tree farm! This is a great activity to do to let your kiddo run around and get some wiggles out in the fresh air. If you’re really on your game, arrange to have a friend come with you so you can take some family pictures and maybe get one good enough for your Christmas cards! Mix all ingredients into a large bowl and slowly stir in 1 1/4 cups boiling water. Mix well, then set aside for 10-15 minutes and allow to cool. Roll into balls and hand out to the kids! Don’t forget to store your playdough in an airtight container! 10. Go to the fair. Fall and winter are the best times to check out local fairs! The weather is usually beautiful during the day to wander around various vendor booths, taste local foods and pick up a cotton candy or hot pretzel! Make a day of it by packing a blanket and having a picnic in a local park, too! There are a lot of things you can do with your toddlers this winter to keep them entertained. I hope this list gives you some inspiration for keeping those kiddos active and busy this winter!